(now how's that for projecting at the dawn of the Space age?! ;-) It looks like "d" may have been an abbreviation for "single-digit", as in < "d" indicates a single-digit character" >. > Yes, memos were the way to communicate technical issues within the 1401 development team. In general, memos were frequent throughout IBM. That is until the attorneys handling the several antitrust law suits were required to produce them to opposing counsel as evidence. > I remember Tom Barr of Cravath Swain & Moore letting everyone know how he felt about that. Tom was lead outside counsel in the Dept of Justice v. IBM case. > Thank you for forwarding this. It is fascinating. I have three thoughts. > I have no idea why the modifier is called "d". > The IBM 1401 project being my first job, I was introduced to the ideas of memos immediately. I found it was a great way to keep everyone in the loop and stay informed. Many memos were "to file" and provided hard copy evidence, in one spot, of any actions or decisions. On a subsequent IBM assignment, I didn't find such a rigorous procedure. I don't know to this day if other companies used memos as consistently. I suspect this is one reason why the 1401 group seemed to have a minimum of misunderstandings. The memos that I scanned and forwarded to Ed which he put on the 1401 site were largely those of Paul Farbanish, who saved them in a binder and gave them to me for background information and historical records when he left for grad school in the early sixties. They and the ones I accumulated are still in my attic. The ensuing interactions between secretary and engineer required patience on both sides, particularly if the engineer had poor penmanship or if the secretary was a poor typist. (I recall letting a minor typo slide rather than go back to the secretary for a third typing.) It amazes me that the group was so conscientious about such memos. I was because everyone else was. I guess it was in the culture. > I always thought that Fran Underwood was a type of genius and these memos help verify that. He was a Renaissance man in his everyday life from his art to his technical savvy, to his social life. He and I became somewhat close in the time between when we re-met in 2009 in California (due to your instigation) and his death. We corresponded by email often, on everything from puzzles and conundrums on the internet to 1401 memories, to advice to me to get on with my life after I mentioned I missed my late wife. But his 1957-58 memos show in pretty much detail how the 1401 evolved. I am amazed how he did this in one year. I assume it was by himself and wonder if he ever bounced ideas off of others. The memos show the big picture of business needs and how they relate to the system he proposes. Yet he shows great detail in his logic descriptions, printer design, programming, etc. Few people could do this. (I still chuckle at his hatred of plug boards. I recall him getting disgusted when a peripheral proposed to be attached to the 1401 contained a plug board. "GET IT OUT!") Note that the "blueprint" drawings are drafted by him and are impeccable. Similarly, the punch card layout and computer program are his own work down to the last detail, even his beautiful signature and initials. He was one of a kind. > Subject: [1401_founders] Re: Fran's SPACE design memos (was RE: [1401_software] How did the "d-character" get its name? >     It's admirable that you dug into Fran's early design documents - they're an interesting read! in the "Endicott section" of the IBM archives storage shelves in 2011 (out of 100's). I suspect the boxes were from IP/patent offices. >     There's still one more of Fran's SPACE design memos that I need to scan and upload. in well thought out memos that have survived for fifty years as paper artifacts. > Subject: RE: [1401_software] How did the "d-character" get its name? sequential naming, at a time when the mutating 1401 architecture had A, B and C address fields. 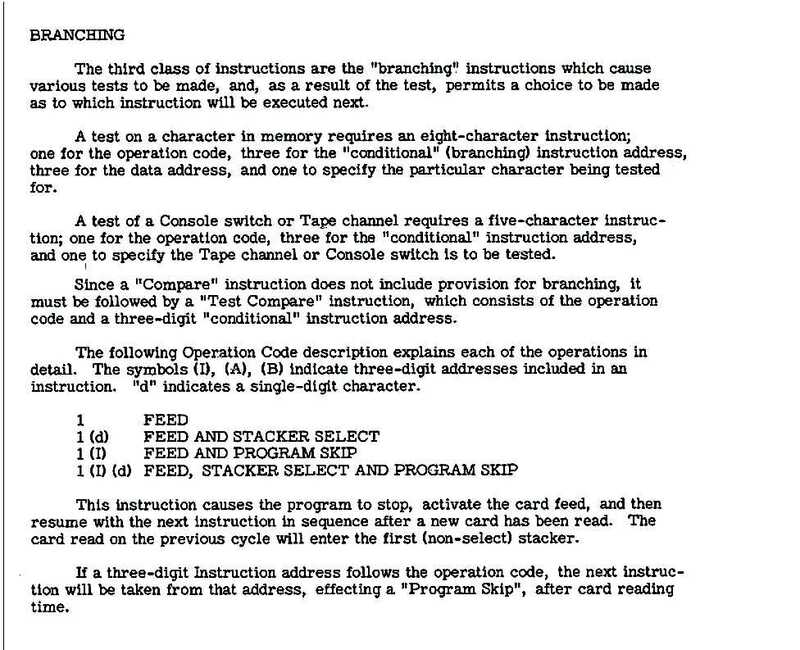 I first encountered the d-char field, on page 3 where he discusses branching instructions. discard the idea of four-address instructions or two-character binary only 	addresses. >     Subject: [1401_software] How did the "d-character" get its name? d-character (or d modifier) that changes the action of the opcode.